The Andaman Islands are an Indian archipelago in the Bay of Bengal. There are roughly 300 islands, which are known for their palm-lined, white-sand beaches, mangroves and tropical rainforests. However, it was the deep and protected water that attracted Oldendorff Carriers to the Andaman Islands. Our geared panamax Trina Oldendorff (75,053 tdw built 2013) loaded 73,086 mt of coking coal from Gladstone, Australia and sailed to the Andaman Islands. Off Port Meadow, she successfully transhipped 25,000 mt of coal into the M/V Spar Rigel (58,000 tdw built 2010) for transport to the Indian port of Haldia, where there is a maximum draft restriction of about 7.5 metres. 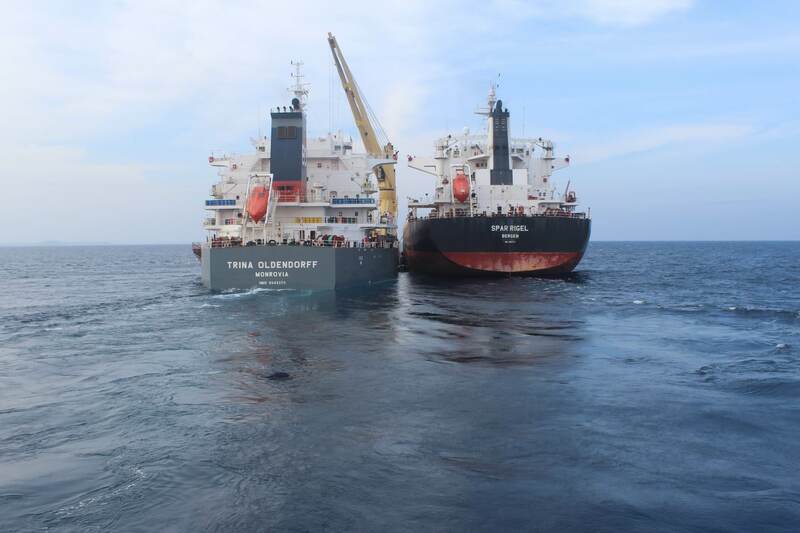 The Trina Oldendorff proceeded to discharge part of the remaining cargo in India. After clearing formalities in Port Blair, both vessels proceeded north for about 18 nautical miles toward the anchorage at Port Meadow. About half way to Port Meadow, the vessels started to slowly come together so that by the time they anchored in Port Meadow they were secured side-by-side. 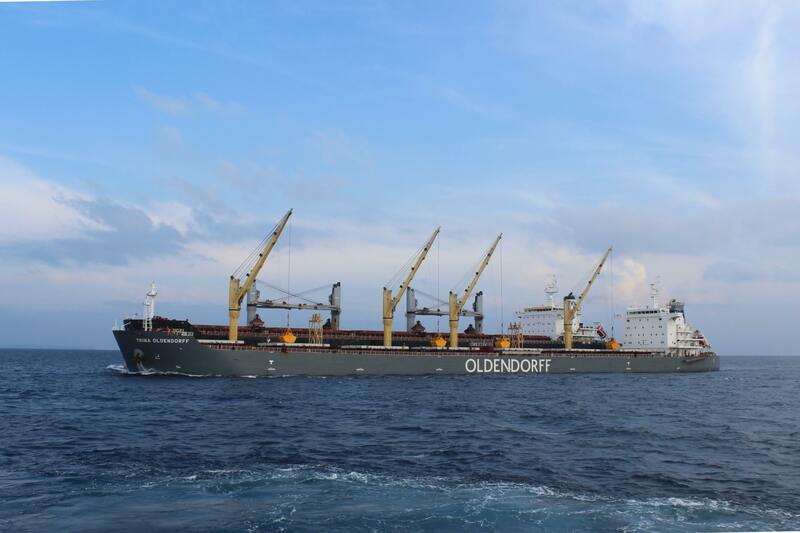 The transhipment was carried out using the side mounted cranes and grabs of the Trina Oldendorff. The vessel was converted to a side mounted geared vessel last year at Chengxi shipyard in China. Four x 36-ton MacGregor cranes with grabs were fitted on the starboard side to give an outreach of 30 metres. Oldendorff and its joint venture partner India Power have worked for the past 2 years to initiate a first trial shipment to develop Port Meadow as a transhipment hub. The two parties worked with Oldendorffs’ customer, TATA Steel Ltd., to realize this unique operation. All Parties worked closely together with the Harbour Master, Port Authorities, Customs and Immigration at Point Blair, Kolkata and Delhi in order to get the required approvals. Overall, the operation was a perfect example of how many different parties can cooperate to promote a new business idea. 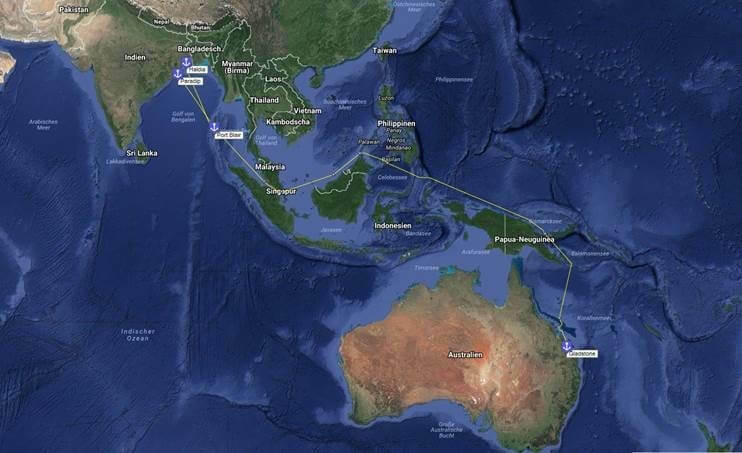 We are already planning our next transhipment operation in the Andaman Islands. We expect our transhipment vessel to then enter into a shuttle trade between Haldia and the Andaman Islands. Our transhipment vessels are capable of lightering incoming bulk carriers from panamax up to capesize.